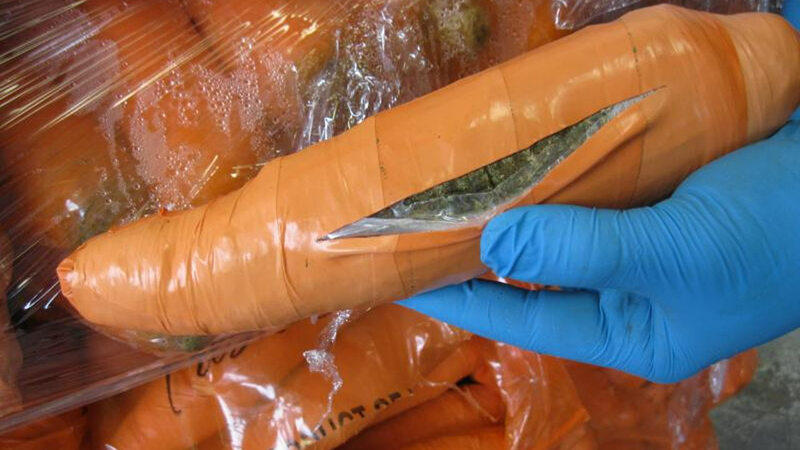 PHARR, Texas -- U.S. Customs and Border Protection agents in Texas caught smugglers trying to sneak in 2,393 pounds of marijuana disguised as carrots. Officials at the Pharr-Reynosa International Bridge cargo facility found 2,817 carrot-shaped bags mixed in with real carrots shipped from Mexico. Drug-sniffing dogs made the discovery on Sunday. "Once again, drug smuggling organizations have demonstrated their creativity in attempting to smuggle large quantities of narcotics across the U.S./Mexico border," said Efrain Solis Jr, the port director. "Our officers are always ready to meet those challenges and remain vigilant towards any type of illicit activities." Authorities said the drugs have an estimated street value of $499,000. A probe is underway by Homeland Security Investigations.